Cantata is a graphical client for MPD. It contains the following features: Cantata started off as a fork of QtMPC, mainly to provide better KDE integration - by using KDE libraries/classes wherever possible. However, the code (and user interface) is now very different to that of QtMPC, and both KDE and Qt (Linux) builds have the same feature set. Also, as of 1.4.0, by default Cantata is built as a Qt-only application (with no KDE dependencies). Unlike most other MPD clients, Cantata caches a copy of the MPD music library. This is so that it can create a proper hierarchy of artists and albums (where Cantata will use the AlbumArtist tag if found, otherwise it will fallback to the Artist tag), to provide album counts, tracks counts, etc in the browser views and tooltips, and also to help with copying songs to/from devices. 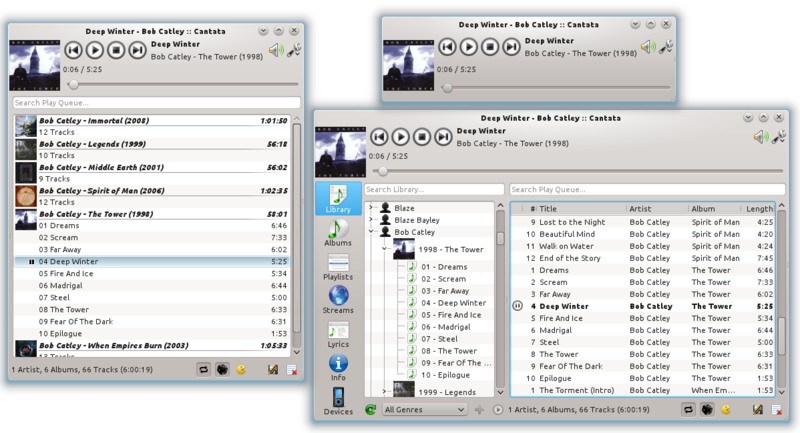 ## Features - Support for Qt4, Qt5, KDE, MacOSX, and Windows. Songs grouped by album in play queue. Context view to show artist, album, and song information of current track. File organizer - use tags to organize files and folders. Online services; Jamendo, Magnatune, SoundCloud, and Podcasts. Radio stream support - with the ability to search for streams via TuneIn, ShoutCast, or Dirble. Playback of non-MPD songs - via simple in-built HTTP server if connected to MPD via a standard socket, otherwise filepath is sent to MPD. Ubuntu/ambiance theme integration - including dragging of window via toolbar. Basic support for touch-style interface (views are made ‘flickable’).